This book is a fun way to remind children that God is always near and strong enough to take care of them--even when they think they're facing all kinds of monsters in the dark with no one to protect them. - Publisher There's nothing scarier to children than thinking they're in the dark, facing all kinds of monsters, with no one to protect them. God is Bigger! is a fun way to remind children that God is always near and strong enough to take care of them. Children will love hearing the accompanying CD of the song made popular by their favorite VeggieTales(r) characters and will want to see the colorful pictures and hear the story time and again as they learn about facing their fears with God by their side. 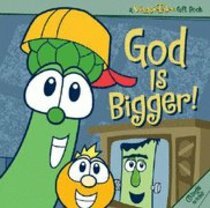 About "God is Bigger (With Audio CD) (Veggie Tales (Veggietales) Series)"
There's nothing scarier to children than thinking they're in the dark, facing all kinds of monsters, with no one to protect them. God is Bigger! is a fun way to remind children that God is always near and strong enough to take care of them. Children will love hearing the accompanying CD of the song made popular by their favorite VeggieTales(r) characters and will want to see the colorful pictures and hear the story time and again as they learn about facing their fears with God by their side.